It seems like a long-forgotten era now, but once upon a time, you couldn't swing a virtual stick on the internet without hitting a piece of fan art, pirated episode, or meme based on the TV show My Little Pony: Friendship is Magic. At one point (2011, specifically), nine members of the fandom even formed an indie development group dubbed "Mane6" and began developing a 2D fighting game called My Little Pony: Fighting is Magic. The game drew tons of attention, even garnering an invitation to the EVO fighting game tournament in 2012 and 2013. Then came the cease-and-desist letter. Hasbro, known for being quite lenient with MLP fans up to that point, put its foot - or would it be hoof? - down. The game was cancelled, and many who had been following the game's development figured that was the end. But here we are in February 2018, and Mane6 is about to release an original game beholden to no one's copyright but its own: Them's Fightin' Herds. Friendship is Magic, helmed by Lauren Faust, was itself a reboot of the My Little Pony show and toy line from the '80s. Faust is an experienced animator, screenwriter, and producer, with credits in films and TV shows like The Iron Giant, The Powerpuff Girls, and Foster's Home for Imaginary Friends. When she heard about Mane6 and the legal trouble the team ran into from using Hasbro's characters, she offered to design new, original characters and help flesh out the game's story. 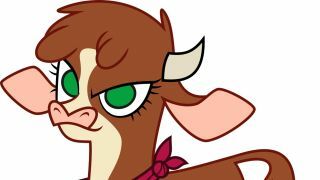 So now, instead of Applejack, the pony with the rough-and-tumble attitude of a cowgirl, Them's Fightin' Herds has Arizona, an actual cow girl. There's also Oleander the unicorn, Paprika the alpaca, Pom the lamb, Tianhuo the dragon, and Velvet the reindeer. Respectively, their personalities mirror Twilight Sparkle, Pinkie Pie, Fluttershy, Rainbow Dash, and Rarity. It's a clever way around legal red tape while keeping what fans of Friendship is Magic love about the show: Faust's art and the archetypes that make each character immediately identifiable and unique. Sticking close to the original cast's style also helps in terms of workload; after all, if you've already got animations and data for an ungulate using a lasso, it's a lot less difficult to change that into a different four-legged animal than making it into, say, a biped. Looks alone will only get you so far, though. Even with Faust's involvement, Mane6 is only a handful of people, many of whom lack a history of game development. Them's Fightin' Herds will also only have six playable characters at launch, far fewer than many fighting games of the modern era. This doesn't prevent the game from being good (the world will find that out when Them's Fightin' Herds comes to PC, Mac, and Linux on February 22) but it does present another hurdle to mainstream adoption. To help get the game into more people's hands, Mane6 has partnered with Humble Publishing, a division of Humble Bundle created in February 2017. Yep, the digital storefront where games get collected into pay-what-you-want bundles to help support various charities now has a publishing arm. In turn, Humble Publishing has reached out to other fighting game developers, bringing a little bit of their worlds into Them's Fightin' Herds. If you own Guilty Gear Xrd Revelator 2, BlazBlue Centralfiction, or Skullgirls 2nd Encore (other 2D fighting games with dedicated communities), you'll unlock unique cosmetic items for use in Them's Fightin' Herds' lobby. The lobby itself isn't just for waiting around though, and in fact Them's Fightin' Herds is making its system more interesting and involved than many of its AAA competitors. Presented as a pixelated world with a top-down view, Them's Fightin' Herds' lobby is more reminiscent of an old-school RPG or Zelda game than a waiting room for your next fight. It also incentivises players to battle and stay engaged through 'combat chests'. When at least two players occupy the same server, a combat chest will spawn in at a random location on the map. The chest takes 10 seconds to open, and other players can use that window to challenge the would-be opener for the goods inside. You'll get a cosmetic item just for participation (so don't worry if you lose), but winning a combat chest fight has the chance to reward an item that's more rare / of a higher value. Once you've won enough combat chest battles, you'll unlock a dungeon crawler mini-game. Everyone on the server who qualifies can enter a special dungeon, where they'll take on hordes of AI-controlled fighters. The dungeon hides away some of the game's most extravagant and ridiculous vanity items, while also containing even more combat chests that players can fight over. In short, the game has grown from a fan project that (while cute!) probably would have garnered a flash of attention before being set aside, to a creative indie project with solid backing, partnerships, and ideas on how to keep players playing. Whether you've been following Them's Fightin' Herds since it was Fighting is Magic or are just hearing about it for the first time (or, like me, had an "oh yeah, that game" moment), it looks like it'll be well worth watching.